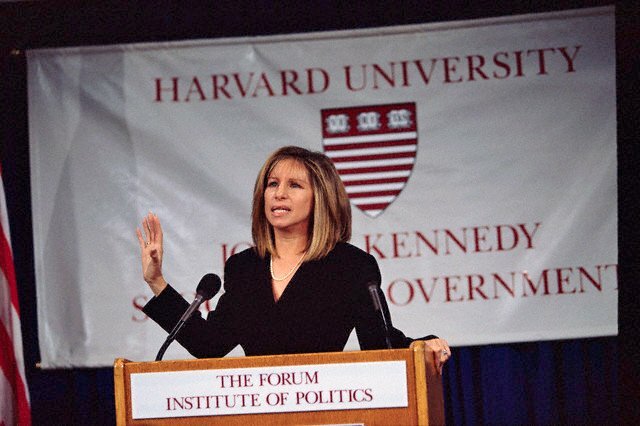 Barbra To Headline British Summer Time Hyde Park – This July! Year after year, Barclaycard presents British Summer Time Hyde Park brings the greatest artists to the stage in Hyde Park. This year, a true icon, pioneer and one of the most important artists of the last half-century will make her BST Hyde Park debut – Barbra Streisand. I want to thank Norman Lear and Dr. Michael Oppenheimer for their kind words. And many thanks to UCLA’s Institute of the Environment and Sustainability for this wonderful award. I am humbled and honored. It’s always upsetting when my words are taken out of context. Cloning Sammie… setting the record straight. I cloned Sammie once when she died… yet I keep hearing I cloned her two times. You can get a litter of puppies from one cloning… and that’s what we got. I also read that I cloned her in Korea… also untrue. It was in the USA. The cost was half of what they say! I explained my reasons in this article which I feel I must share again. He was a good senator and a good man who never lost his sense of humor. He was unafraid to speak out against his own party and even helped me in the fight against women’s heart disease! He will be sorely missed. Thank you, Dr. Collins, for your work to improve human health, including the Human Genome Project and the “All of Us” Precision Medicine Biobank. And thank you all for making me feel so welcome. NIH is known for its world-renowned trailblazing medical research. The closest thing I have to a medical credential is my role in What’s Up, Doc? There has not been a single woman who has won the Golden Globe for Best Director since I was fortunate enough to win it for Yentl in 1984…that’s 34 years ago! Not right! More women should be directing! In my humble opinion, I was very disappointed that director Dee Rees and her powerful film Mudbound wasn’t even nominated. Thank you Alabama for giving our country a great Hanukkah present by electing Doug Jones. Now we can have fun watching McConnell blame Bannon; FOX News blaming McConnell; and waiting to see who blames Trump and who he blames, fingers pointing in all directions. Of course, we will have to watch McConnell push the obscene tax vote before Jones is seated. Last night, voters signed a referendum against Donald Trump and his regressive and divisive policies. His unpopularity and the resistance from activists helped fuel Democratic victories across the nation. The victories had both breathe and depth from school boards and city councils to Governor’s mansions. The latest Census report on poverty in America found the number of Americans without health insurance continues to rise. If you thought Tom DeLay’s Texas gerrymandering scam in 2003 was bad, just wait. Now partisans are seeking to steal the 2008 presidential election. It’s not really Alberto Gonzales’ fault. President Bush’s attorney general, who long ago relinquished any thread of credibility, finally gave up his position as the nation’s top law enforcement official on Monday. The Colorado Springs Gazette is one of the two most conservative papers in America (the other being the Waterbury Republican-American). On August 31, 2005, when the first corpses began floating down the Lower 7th Ward’s byways and George W. Bush was still enjoying a Crawford vacation, blogger Kevin Drum, as is so often the case, was first across the post with a rundown on the state of the Federal Emergency Management Agency. The Electoral College should be abolished, but there is a right way to do it and a wrong way. Do you, like me, live in one of those states where electricity has been deregulated and your utility rates have skyrocketed? A new documentary offers a portrait of combat and its aftermath that bears no relation to the sanitized version of war that often comes from politicians and the news media. Correcting media misinformation on Barbra Streisand’s cloning of her beloved dog, Samantha. Why do fake stories sell more than true ones? When I do an interview, I like to be quoted accurately. I also expect the truth to be told, with facts checked. That’s what the GOP senator who’ll be taking control of the environment committee told me several years ago. Larry Kramer does not need me to publicize his beautiful play. It stands on its own. For the last time – I will answer his complaints, which rewrite history. “Void Of Even A Sniff Of Truth…” by Jim Brolin. In an ovation-filled evening, Barbra Streisand received the Paley Media Center’s coveted Icon Tribute Award from that organization’s CEO and President Maureen Reidy, culminating an evening of laughter and surprising revelations as television’s noted power producer and lifelong Streisand fan, Ryan Murphy, engaged in a conversation of candor, truth, wit and charm with the star. Attn. Streisand Foundation Staff & Ms. Streisand. 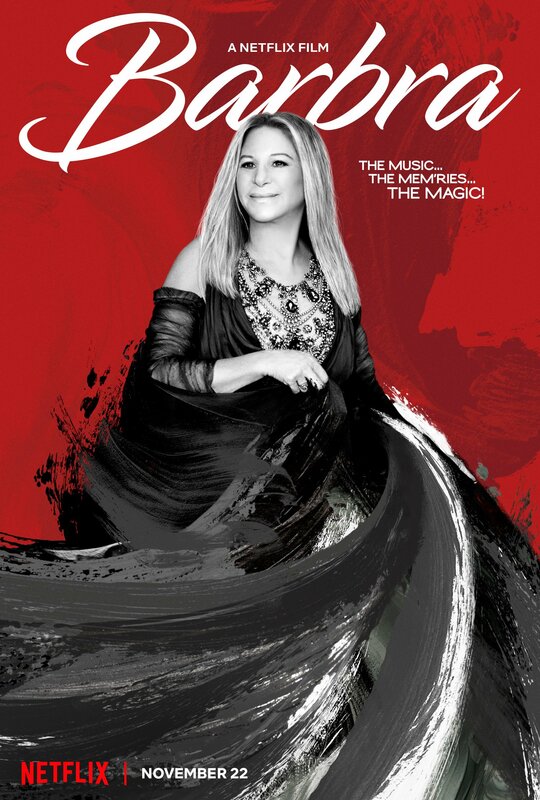 Barbra in Variety Magazine – Out now. In a world full of bad news… take a breather! NETFLIX TV SPECIAL PREMIERING ON 11/22. Netflix unveiled new art for Barbra’s upcoming concert special The Music… The Mem’ries… The Magic!, premiering November 22nd. © 2015 Sony Music Entertainment. All Rights Reserved.